KDDI have announced that two of the new models introduced for their autumn line up will go on sale this weekend. 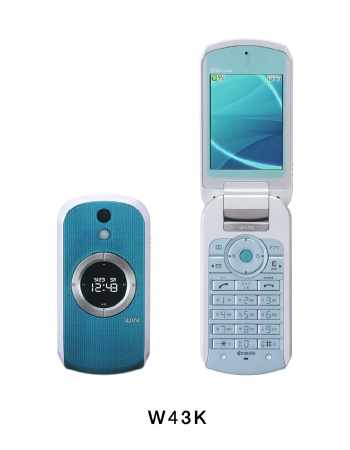 The W43K by Kyocera and W42SA by Sanyo are both Win-series (CDMA 1X EV-DO) phones with features ranging from enhanced music and an m-commerce FeliCa chip to the PC-Site Viewer and cool new Camera-Dictionary functions. Details [in Japanese] here. The W43K has an interesting circular touch-sensitive front face plate with jog shuttle design to control the volume, select music tracks and even seek radio stations. The unit also comes with a funky base recharger that includes a built-in sub-woofer for ‘full-sound’ playback! - It is sensor ring key equipped with a mobile 2.6-inch ASV liquid crystal and wallet cellular phone (R) of the music function enhancement with a smart music operation -. It is “Sensor ring key”, “Charge stand with the subwoofer”, and sticking to to music. Music can be operated while shut by “Sensor ring key” in which four direction key installed on a sub-display combines with the touch sensor. Moreover, an indirect lighting has “Ring illumination” in which the illumination lights, and blue light colors the cellular phone by various scenes of the musical reproduction (note 1) and arrival of a message and the mail reception, etc.Moreover, DBEX ™. (note 2)Car audio etc. in addition to the function achieved “BBE(R)M3″ (note 3) that optimized the tone quality improvement technology of the BBE Sound Co. where the introduction results existed for the cellular phone and achieved a natural, clear tone quality near an original sound in the world equipped with the first (note 4). To make the best use of the high quality sound, the charge stand that can enjoy music with power or more as home audio besides ..high sound quality made by Sony earphone.. attaching with the subwoofer is attached. It can enjoy “au LISTEN MOBILE SERVICE” by high sound quality on the bought day. Note 3) BBE is BBE Sound . It is a registered trademark of Inc.. It is easy to see easily, and to do the camera shoot to outdoor by a mobile 2.6-inch ASV liquid crystal. A mobile ASV liquid crystal that applies the ASV liquid crystal technology used with the LCD TV is adopted. A large screen can be used by a lot of scenes like the camera shoot etc. including using “PC site viewer” and “EZ passenger’s seat Nabis”. It corresponds to “Mobility Suica” of East Japan Railway Company (The headquarters: Shibuya Ward, Tokyo and President and Representative Director: Satoru Kiyono) besides wallet cellular phone (R) can be used more conveniently and widely because “QUICPay” of the cellular phone credit is pre-installed. Moreover, security and easiness to use are united by the FeliCa lock quick release function with the sensor ring key. It came to be able to identify the content of the reached mail, and to choose the emotion icon to inform of feelings with the icon according to three kinds. Convenient service and the function such as “PC site viewer” in which the WEB site for the personal computer can be inspected by being relieved also to the data exchange such as address books in the infrared rays communication function and the fixed charge system that conveniently becomes the remote control such as the televisions are enhanced. The front side of the main body aimed at the atmosphere of digital audio equipment by money of clear Dimple plate where the speaker net was imaged and “Sensor ring key” belonging and preparing and combining feeling of quality. Inside..design..frameless..key..push..easiness..not to mention..flat..key..shape..character representation..externals..design..union..improve..detail..digital..audio..equipment..expression..pursue. “Smooth design” of beauty without projection even if it shuts to compact size of about 49mm×99mm×19.4mm or it opens. When operating it, coexisting of beauty and the operativeness of externals has been achieved because it doesn’t hit the hinge the fingernail. It provides with the touch sensor pad in the ten keys area, and it is possible setting/to release it by tracing the figure of the favor only by tracing on ten keys instead of “Handwritten input function” in which the character can be input and the password number. The automatic focus of the camera works when it touches “Scroll tap function” in which the cursor movement of the menu etc. , the scroll in E-mail and the WEB screen, and the decision operations besides a convenient “Smoothness lock function” for the business can be easily operated and ten keys, and it is possible to take a picture, and the usage of four total such as “Smoothness automatic focus function” can be done if it pushes as it is. An easy-to-use function is fully loaded of one not good at the operation of the cellular phone such as “Character” “Key”. Because the character is seen easily, the display is seen easily by “Key” of a large-scale keypad, and it is easy to push because it corresponds to “Character”, it is possible to use it at ease even in one not good at the operation of the cellular phone. 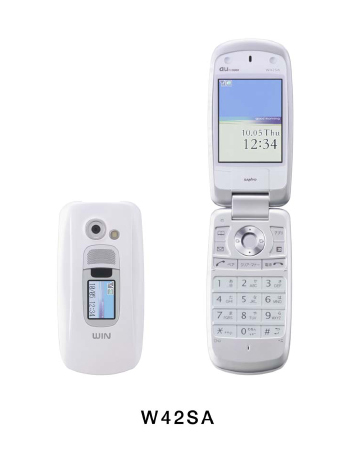 It is possible to use it more comfortably even in the place where “Pict display” that greatly displays the battery remainder amount display and the antenna display on the waiting screen and other party’s voices are not caught easily because it corresponds to “Receiving talk volume” etc. in which an excellent telephone call becomes possible. Moreover, everyone can easily use the function of WIN equipped with a smart mode. It enjoys “au LISTEN MOBILE SERVICE” by high sound quality with the high sound quality earphone of a high quality sound and an attachment near an original sound. DBEX™ (note 5)It can enjoy the sound equipped with the function near high quality an original sound. To make the best use of the high quality sound, it is ..high sound quality made by Sony earphone.. attached. It can enjoy “au LISTEN MOBILE SERVICE” by high sound quality on the bought day. Useful service and the function such as “PC site viewer” in which the WEB site for the personal computer can be inspected by being relieved also to the data exchange such as address books including the camera with 1.98 million-pixel automatic focus equipped with “Camera de dictionary function” in the infrared rays communication function and the fixed charge system that conveniently becomes the remote control such as the televisions are fully loaded. Manufacturer SANYO Electric Co., Ltd.
- “Wallet cellular phone” is a registered trademark of NTT DoCoMo, Inc..
- “FeliCa” is a technological method of the contactless IC card that Sony Ltd. developed. - “FeliCa” is a registered trademark of Sony Ltd..
- Arrival wear ..singing.. ..(R).. ..singing.. full (R) is a registered trademark of Sony Music Entertainment Ltd..
- The trademark that relates to BREW(R) and BREW(R) is a trademark or a registered trademark of the QUALCOMM Co..
- “Wnn” ” is ..”.. registered trademark of Omron Ltd.. “Advanced Wnn” is a trademark of Omron software Ltd..
- “ATOK” “Guess conversion” “APOT(Advanced Prediction Optimization Technology)” is a registered trademark of Just System Ltd..
- It is necessary to buy software “SD-Jukebox” made of Matsushita Electric Industrial Co., Ltd. separately.